George Lee, Elsie, NE visiting with Butch Schuler. Lee purchased a couple bulls at the Schuler Red Angus sale. Patterson Ranch, Casper, WY. Repeat Schuler Red Angus bull buyers. 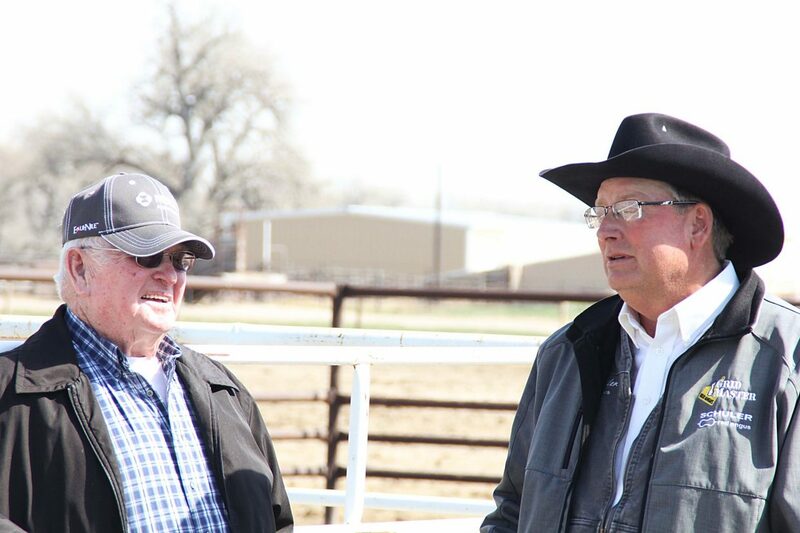 Ranchers enjoyed a beautiful day to appraise the offering at the Schuler Red Angus 35th Annual Bull Sale held March 23rd at the ranch near Bridgeport, Nebraska. Although the Schuler program is built upon the reproductive and maternal traits required to "Get the Cow Right First," their genetics have earned numerous Red Angus "GridMaster" awards for the Schuler's and their customers. The Schuler Red Angus leadership in carcass data collection is well into its third decade; providing 20 percent of the harvest data collected on Red Angus sires. Annually, the Schuler program tests young sires for carcass and feed efficiency data to ensure they produce transmit these economically relevant traits demanded by downstream beef industry customers. A large crowd of ranchers from Nebraska and surrounding states competed for the Red Angus and Schuler Red Composite bulls giving the Schuler family an excellent sale. The high selling bull was Lot 2, Schuler Top Hand D911. This son of Defender 560-30Z was raised by a Schuler Endurance 2101Z first calf heifer and brought $20,000 for one-half interest and full possession, going to long-time customer, Olsen Ranches, Inc. of Harrisburg, NE. Top Hand combined double-digit calving ease and triple-digit growth with a best 1 percent GridMaster Index. A three-quarter brother to Lot 2, Schuler Amplify 6206D sold as Lot 1 and became the 2nd high selling Red Angus bull. This top-performing son of Defender 560-30Z sold to Wedel Red Angus of Leoti, Kansas, at $11,500 for one-half interest and full possession. The Schuler Red Composite program is now in its third decade of providing ranchers with a user-friendly solution to profit through increased heterosis and breed complementarity. Buyers could select for uniform sire groups that varied from ½ to 7/8 Red Angus genetics. Janssen Red Angus of Geneseo, KS purchased the high-selling Schuler Red Composite bull – Lot 129, Schuler Red 71 Amped D303, a top 2 percent GridMaster son of Defender 560-30Z for $16,500. A&T Cattle Co. of Hay Springs, NE purchased Lot 146, Schuler Red 44 Yukon D336 at $10,00 for one-half interest and full possession. In addition to providing a user-friendly solution to add heterosis, this Schuler Red 44 (half Red Angus/half continental) ranked in the top 1 percent for GridMaster and 2 percent for Marbling when compared to purebred Red Angus. He also ranked in the top 5 percent for REA when compared to SimAngus. 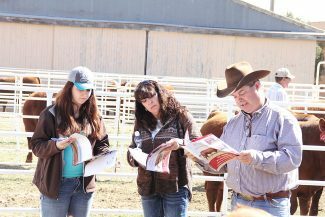 Repeat customers of the Schuler program, Kenansville Cattle Company, FL and Cullan Farms, NE returned to make volume selections from the 35th annual offering.